It’s been hard for news readers to avoid the word “recession” this January. 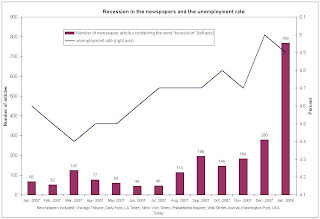 The number of newspaper stories mentioning it has certainly been overwhelming (see Chart 1). Weak economic data might seem to justify the gloom. Growth has slowed down and the labor market has weakened. Still, we haven’t seen a single quarter of negative growth, and the employment figures have been equivocal, and certainly not recessionary. So, given what we know about the state of the economy, is all this recession chatter justified, or are journalists getting carried away? To answer that question, I have put together data on the tone of economic reporting in the newspapers, as well as on indicators of the health of the real economy. Then I have estimated a statistical model and compared the level of pessimism of the newspapers with the actual mood that one would expect based on the known state of the economy. The results are pretty exciting. 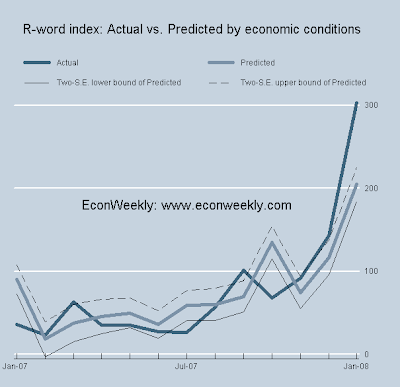 So exciting, in fact, that I plan on updating and reporting my calculations every month, here on EconWeekly. My model shows that newspapers have indeed been too gloomy this past month. In January, known economic conditions would have justified about 200 stories mentioning the word “recession”; the actual count was around 300. Up until December, however, newspaper mood was approximately in line with the actual state of the economy. (See Chart 3.) Why did newspaper sentiment diverge from economic fundamentals last month? Economics reporting is a bit different because the state of the economy can be measured and verified more objectively. As a result, views are more homogeneous across audiences. Still, media outlets need to take into account three factors which determine the views news consumers, and therefore the choice of tone and volume of economic reports: intrinsic pessimism, past reports on the state of the economy, and reports from other media outlets. Bryan Caplan of George Mason University has identified pessimism as one of the four capital biases of the average Joe. (Read this summary.) People routinely see negative trends in long-term living standards, wages, inequality, etc. The gloom extends to the state of the economy at any given moment. About half of Americans have been thinking that we are in a recession, or on the brink of one, since October! Where that pessimism comes from, I have no idea. David Hume, Caplan says, thought that “the humour of blaming the present, and admiring the past, is strongly rooted in human nature.” It sounds appealing. But whichever the reason, the media recognize the appeal of worrying reports about the economy —and deliver. Inherent pessimism influences the interpretation that the media put on any given piece of hard data. But once the newspapers set clouds in the horizon, their incentives to deliver negative news become stronger, because they need to conform to the readers’ expectations. A newspaper that changed its view on the state of the economy would go against the prior views —plus, it would be accused of the horrible crime of flip-flopping. A newspaper has therefore an incentive to keep a certain mood even on something as relatively objective as the state of the economy. Past negative reports will lead to more negative reports in the future, feeding a cycle of pessimism, unless new hard data against such views are so strong that the paper is forced to tone it down over time. Finally, people are exposed to reports from more than one source of information, even if it’s secondhand. Any newspaper that strayed from the average mood of all other newspapers would conflict with the established view, alienating itself. Any given outlet has thus an incentive to stay in line with the tone of all the major media, resulting in “herd behavior”: the tendency to base decisions (in this case the tone of the news) on the behavior of the rest of the community (other media outlets). The combination of natural pessimism and the need to conform to the public’s views, therefore, explains why sometimes reporting on the economy is not consistent with actual events, as is the case now. 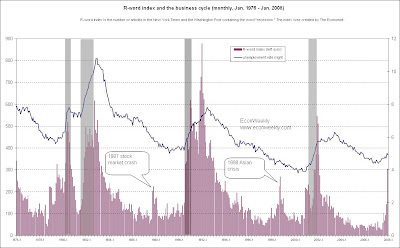 Only policymakers, animal spirits and time can determine whether we’ll see a recession in 2008. For now, skip the editorials on economics. VAR, with monthly data, from January of 1976 through the latest month available. Each equation includes six lags. The variables are: the R-word index, the unemployment rate, the change in nonfarm payrolls, the slope of the yield curve (10-year minus 1-year), the growth of personal consumption expenditures on durable goods accumulated over the current and previous two months, and the growth of the industrial production index, also accumulated over the same period. I also include a set of monthly dummies and a dummy variable that equals 1 if the NBER announced a decline in real GDP. The unemployment rate is the first release reported by the BLS. The change in payrolls mimics the one reported by the BLS, that is, it is equal to the first estimate of payrolls for month t, minus the revised (first update) figure for month t-1. Both unemployment and payroll figures come from ALFRED. The yields on the ten-year bond and the one-year Treasury bill are monthly averages, from FRED. Durable expenditures come from the NIPA accounts, via FRED, and the industrial production index is from the Federal Reserve, also via FRED.